Announcing the new St. Luke Mobile Parish App. Yes! this means you can access St. Luke information and interact with St. Luke staff and parishioners right from your smartphone. You’ll find the official church calendar, mass times, daily readings, staff contact information, Catholic news, and Catholic prayer, read the latest bulletin, and make contributions through our WeShare online giving site. 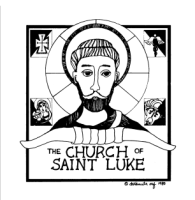 You will receive a message instructing you to download our app, just tap on the link and a new app icon will appear on your home screen bearing the face of St. Luke as you know him from our parish logo. It’s easy!